Another “moving average” (MA) approach to filtering of data is to perform a least squares curve fit of the input data. Since this filter just depends on recent input values, it is in the general category of MA filters, also called finite impulse response (FIR) filters. You can estimate the current value (“filtering”) or previous values anywhere within the time window of the input data (“smoothing”). Like any MA filter, a least-squares filter completes a step response in finite time. (Click the plot for full-sized image.) The example for this plot was a filter based on the nine most recent filter input values, with sampling at equal time intervals. This filter performed a linear curve fit. 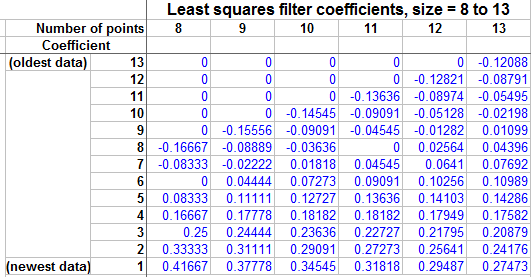 Filters based on higher order polynomials can also be used, but are not recommended for filtering. Higher order polynomials, usually second or third order, are fine for smoothing. The step response for a least squares filter shows “overshoot” in response to a sudden input change: the filter output can change more than the input for a period of time. This can lead to quicker detection of problems, but it also can lead to temporary false alarms. For this reason, caution should be exercised in using these filters. The above comments on overshoot only apply to filtering to estimate the current value. This will not be a problem when “smoothing” to estimate the value at the midpoint of the time window. A benefit of a linear least squares filter is that it will exactly track a ramp input without the lag associated with other filters, once all the input data include the ramp. Least squares filters are best used mainly for slowly changing variables, because they can give quirky results for signals with higher frequencies. (A step input can be thought of as containing all frequencies). Higher-order polynomial filters should probably be avoided for filtering because the response to higher frequencies gets even more quirky, This is less of an issue for smoothing. y(k) is the newest (current) filtered (output) value. The special case of a 2-point filter is just included for completeness - you wouldn’t ever need to use that. The least squares fit of a straight line for two points goes through both those points, so the least squares estimate is simply the newest input. The sum of all the coefficients is always 1.0 (within rounding error in the tables above), is a requirement because the response to a steady input (or step response) must match the output when the input is steady. You can see that the oldest data always enters the filter with negative coefficients, so that the sum of earlier data in response to a step input of 1.0 is greater than one. That’s why there is always overshoot to a step response. For some filter sizes (5, 8, 11), one of the data inputs is completely ignored in each time step. For the most effective noise reduction for the amount of computation, you might as well use filters one size smaller or larger. If you want to use a time period that requires more than 13 data points, consider sampling more slowly at the input to this filter, taking care to avoid aliasing by first filtering with an exponential filter at the higher sample rate. The Savitzky-Golay smoother has advantages over the filter version. One big benefit is that there is no lead or lag. There is no overshoot, and the locations of the peaks in curves are maintained. Also, the area under the curve is maintained. In general, when not using filtered values immediately for control, if a delay in the application can be tolerated, smoothing will be better. Diagnostics can often tolerate some delay, worth the wait if false alarms can be avoided. A linear least squares filter makes an assumption that the input signal has a constant time derivative (fixed slope). If the input signal becomes a ramp, then this filter output will track the ramp, reaching it exactly by the end of the time window. If the slope of the ramp is changed, the filter output will again approach the new ramp. For that reason, this filter is competitive with double exponential smoothing, or alpha beta filtering, which also make a straight line assumption. Those are IIR approximations of the FIR linear least squares filter.